This article is about the group of stars within the constellation Orion. For other uses, see Orion's Belt (disambiguation). Looking for Orion's Belt in the night sky is the easiest way to locate Orion in the sky. The stars are more or less evenly spaced in a straight line, and so can be visualized as the belt of the hunter's clothing. They are best visible in the early night sky during the Northern Winter/Southern Summer, in particular the month of January at around 9:00 pm. The names of the three stars come from Arabic; Alnilam (النظام) means "string of pearls" or is related to the word nilam ("sapphire"); with the spellings Alnihan and Alnitam, all three variants are evidently mistakes in transliteration or copy errors. Mintaka (منطقة) meanwhile has the same root as Alnitak (النطاق), and both mean "belt". Alnitak (ζ Orionis) is a triple star system at the eastern end of Orion's belt and is 1,260 light-years from the Earth. Alnitak B is a 4th-magnitude B-type star which orbits Alnitak A every 1,500 years. The primary (Alnitak A) is itself a close binary, comprising Alnitak Aa (a blue supergiant of spectral type O9.7 Ibe and an apparent magnitude of 2.0) and Alnitak Ab (a blue dwarf of spectral type O9V and an apparent magnitude of about 4). Alnitak Aa is estimated as being up to 28 times as massive as the Sun, and to have a diameter 20 times greater. It is the brightest star of class O in the night sky. Alnilam (ε Orionis) is a supergiant, approximately 2,000 light-years away from Earth and magnitude 1.70. It is the 29th-brightest star in the sky and the fourth-brightest in Orion. It is 375,000 times more luminous than the Sun. Its spectrum serves as one of the stable anchor points by which other stars are classified. Mintaka (δ Orionis) is 1,200 light-years away and shines with magnitude 2.21. Mintaka is 90,000 times more luminous than the Sun. Mintaka is a double star. The two stars orbit around each other every 5.73 days. Richard Hinckley Allen lists many folk names for the Belt of Orion. English ones include: Jacob's Rod or Jacob's Staff; Peter's Staff; the Golden Yard-arm; The L, or Ell; The Ell and Yard; the Yard-stick, and the Yard-wand; the Ellwand; Our Lady's Wand; the Magi / the Three Kings; the Three Marys; or simply the Three Stars. That glitter burnished by the frosty dark. The three stars of the belt are known in Portugal and South America as Las Tres Marías in Spanish, and as "As Três Marias" in Portuguese. They also mark the northern night sky when the Sun is at its lowest point, and were a clear marker for ancient timekeeping. In the Philippines and Puerto Rico, they are called the Los Tres Reyes Magos. The stars start appearing in early January around the time of Epiphany, the Christian holiday commemorating the visit of the Magi to the Child Jesus. In Finnish mythology, the Belt of Orion is called Väinämöisen vyö (Väinämöinen's Belt). The stars which appear to "hang" off the belt form an asterism called Kalevanmiekka (Kaleva's sword). In pre-Christian Scandinavia, the belt was known as Frigg's Distaff (Friggerock) or Freyja's distaff. Similarly Jacob's Staff and Peter's Staff were European biblical derived terms, as were the Three Magi, or the Three Kings. Väinämöinen's Scythe (Kalevala) and Kalevan Sword are terms from Finnish mythology. In the film Men in Black (1997) the protagonists look for "the galaxy", a massive energy source which according to an alien "is on Orion's Belt". The celestial Orion's Belt is searched but no galaxy is found there. Eventually they understand that the galaxy is hidden in a jewel on the neck of the alien's cat, named Orion. 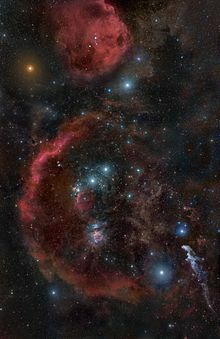 Wikimedia Commons has media related to Orion's Belt. ^ "Orion's Belt: Stars, Facts, Location, Myths | Constellation Guide". www.constellation-guide.com. Retrieved 2018-06-24. ^ Dolan, Chris. "Orion". Archived from the original on 2011-11-28. Retrieved 2011-11-28. ^ Allen, Richard Hinckley (1936). Star-names and their meanings. pp. 314–15. ^ "Alnilam". Jim Kaler's Stars. University of Illinois at Urbana-Champaign. 2009. Archived from the original on 2011-11-28. Retrieved 2011-11-28. ^ "Mintaka". Jim Kaler's Stars. University of Illinois at Urbana-Champaign. 2009. Archived from the original on 2011-11-28. Retrieved 2011-11-28. ^ Allen, Richard Hinkley. "Star Names – Their Lore and Meaning". ^ Allen, Richard Hinckley (1936). Star-names and their meanings. pp. 314–315. ^ Moser, Mary B.; Stephen A. Marlett (2005). Comcáac quih yaza quih hant ihíip hac: Diccionario seri-español-inglés (PDF) (in Spanish and English). Hermosillo, Sonora and Mexico City: Universidad de Sonora and Plaza y Valdés Editores.